Despite what you might think, tattoos aren’t a modern invention. They’ve actually been around for hundreds of years. Keep reading to look at some of the most popular tattoo trends through the decades. These days, it’s not unusual to see tattoos pretty much everywhere you go. Everyone from your barista to your doctor to your kid’s preschool teacher likely has some ink. But that wasn’t always the case. Join us for a fascinating look at tattoo history, as well as the tattoo trends of today. Although many people think of tattoos as edgy and au courant, humans have been permanently marking their skin for centuries. The Iceman, a mummy whose remains were discovered in 1991, and who scientists believe died sometime around 5,200 B.C. has a total of 61 tattoos! In the early years of the 20th century, very few people besides sailors, criminals, and circus or carnival performers had tattoos. In fact, tattoos were so taboo that people would pay to see the “tattooed lady” when the circus or freak show came to town. Two cultural milestones are responsible for an uptick in tattooing in the 1920s and 1930s. The first was the introduction of Social Security numbers. The U.S. government emphasized the importance of remembering this number, and some folks decided that a tattoo was the best way to do so. The other milestone? Movies. Women across the nation aspired to look like the stars of the silver screen, but makeup was expensive, and its quality generally poor. Tattooing presented a permanent way to achieve dramatic eyebrows or the perfect Cupid’s bow lip. World War II, and the millions of men and women whose lives changed dramatically as a result of either enlisting or working in factories. This resulted in another upswing in tattoo popularity. Patriotic tattoos were understandably in big demand during this era. Many of the designs that we consider classic today. Anchors, hearts, swallows, flowers, skulls, pinup girls, and flags — date back to the 1940s. Norman Keith Collins, aka Sailor Jerry, is also associated with this period in tattoo history. His legacy lives on to this day — and if you’ve ever gotten a flash tattoo, you have Sailor Jerry to thank. In the 1950s, tattoos continued to be in demand, riding the wave of postwar patriotism. Then the pendulum began to swing in the other direction. A cultural emphasis on family and traditional gender roles meant that tattoos on women weren’t as widely accepted. Once again, tattoos were relegated to the seedy element of society, the gang members, criminals, and bikers. An outbreak of hepatitis in New York, linked to poor hygiene practices in tattoo parlors. This scared off many potential customers. But that wasn’t enough to stem the rising tide of countercultural rebellion that was taking place during the ’60s and ’70s. Singer Janis Joplin gets a lot of credit for helping tattoos become accepted in the mainstream. Her bracelet tattoo became an iconic symbol of self-expression. After her death in 1970, many women flocked to tattoo parlors to get a bracelet of their own. Skull-and-crossbones imagery peaked in popularity during this era, thanks to biker gangs. Tattoos of all sorts became increasingly visible, although they were still frowned upon in mainstream, polite society. Abstract tattoos, Japanese and Polynesian influences, tribal designs, Celtic knots, and heavy black inkwork emerged as the tattoo trends of the 1980s. A sense of rebellion against the establishment, which had first begun to emerge in the ’60s and ’70s, took on a different face during this decade of excess. No longer were tattoos only seen on motorcycle gang members, criminals, and carny folk. The influence of MTV and music videos helped show the world that musicians in all genres enjoyed getting inked. During this era, tattoos for women also began to gain acceptance. Although they designs were largely small, easy to hide, and feminine in nature. Roses tattooed on hips, fairies on the ankle, dolphins on shoulder blades, and hearts anywhere were among the more common choices for women. Yet the Riot Grrrl movement and the second wave of feminism also emboldened many women to forego conventional tattoo designs, and to get whatever ink they wanted, wherever they wanted it. By 1996, women accounted for more than half of the people with tattoos in the United States. With the new millennium came a new era for tattoos. Reality television gave tattoo artists widespread exposure with shows like Miami Ink and LA Ink — which in turn made Kat VonD a household name. So-called “tramp stamps” were born during the early 2000s, as well. Increased safety practices and regulations helped tattoos gain a foothold in respectable circles. After 9/11, patriotic tattoos saw a huge surge in popularity, with survivors and first responders commemorating the lives lost during the terrorist attacks. Other popular designs included stars, yin-yang symbols, Japanese kanji, and butterflies. It’s during the early years of the 21st century that tattoo acceptance took a huge leap forward, too. Having ink, and especially visible ink, became more and more mainstream. 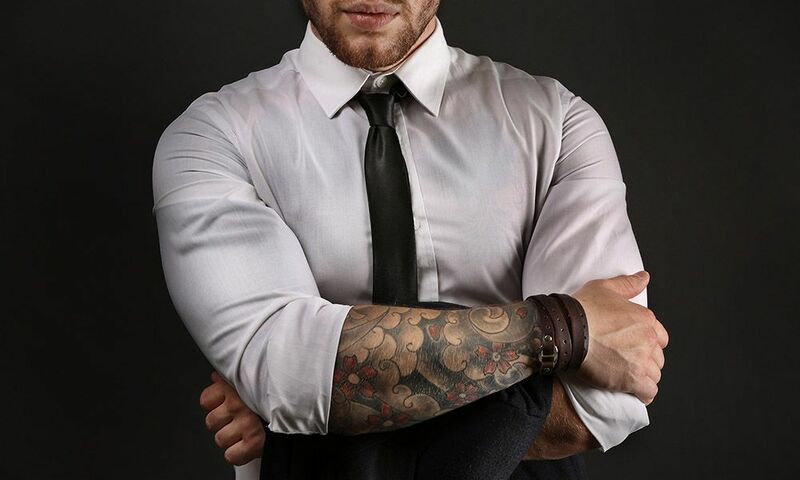 Employers are increasingly changing their dress codes to allow for tattoos, and celebrities such as Rihanna proudly showed off their body art. What tattoo trends do we see today? Artists cite biomechanical designs (think Alien), trash polka, pointillism, geometric designs, feathers, and white ink tattoos as some of the most popular options for tattoos. Pew Research reports that some 20% of Americans — but 40% of Millennials — are tattooed. There’s been much speculation that technology and tattoos will begin to blend together in the coming years. Imagine LED tattoos, tattoos that can deliver information about our bodies (like a built-in fitness tracker), ink made from vegetable dye, “erasable” tattoos, animated tattoos, and much more. Whether you love them or hate them, prefer an old-school pinup girl or the very latest in portraiture. There is no denying that tattoos are here to stay. Over the past 100 years, they have made their way from seedy carnivals and prison cells to Fortune 100 boardrooms. Are you interested in getting a tattoo? Skin Factory Tattoos and Body Piercing would love to answer any questions you may have about the process or book an appointment. Contact us so we can help turn your tattoo dreams into reality!